The Arab Theatre Festival is an annual event organized in a different Arab country each year by the Arab Theatre Institute. This year’s session chose Morocco as the host nation. The Festival took place in the capital Rabat between January 10 and 16, 2015, and was attended by theatre representatives from around the Arab world. This seventh version of the Festival also corresponded with Morocco celebrating the passage of one hundred years since the establishment of a modern theatre tradition there. This gave the festival a particular focus and marked this year as one of the most notable in the history of the Arab Theatre Institute. Ismail Abdellah, the secretary-general of the institute, during a press talk held a day before the opening of the festival, confirmed that all indications promised that the seventh session of the Arab Theatre Festival, the “Moroccanized” version, fully supported by the Moroccan Ministry of Culture, would be a great success as groundwork. He added that the institute had been looking forward to such an event since its launch in 2009, and predicted that the occasion would constitute “a new turn in the history of the Festival.” The Moroccan Minister of Culture, Mohamed Amine Sbihi, announced during the opening ceremony that the seventh celebration, which was being held under the patronage of His Majesty King Mohammed VI, expected the participation of about five hundred Arab attendants belonging to the field of theatre and performance arts, and that a hundred of them would be from Morocco. He added that the event’s effects would not be limited to the area of the capital (Rabat), but extended to reach other cities around the kingdom. All of the cultural centers around Morocco were activated during that period and hosted different cultural activities reflecting the atmosphere of the two ceremonies that were being coordinated: The Arab Theatre Festival and the Centenary of Moroccan Theatre. 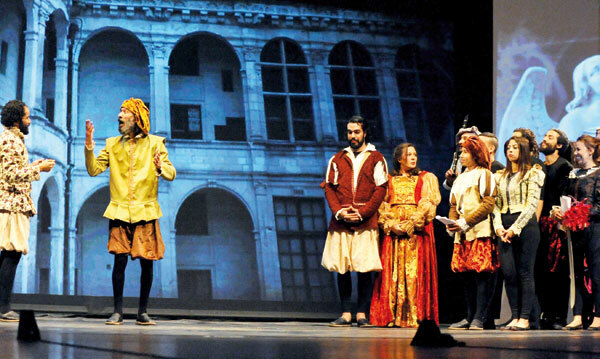 The Seventh Arab Theatre Festival was marked by the organization of cultural activities of various types. One of the most important elements was the presentation of about seventy plays, of which seven dramas competed for the prize of Sheikh Sultan Bin Mohammed Al Qassimi, rewarding the best Arab theatrical show of the year 2014. The tradition of presenting such an award was established as an attempt to keep the Arab theatre active and encourage Arab dramaturgy to carry on updating itself, contemplating, and reflecting upon some of the most prevalent current issues. Moreover, the Festival held the largest scientific conference ever in the domain of theatre and performance studies organized in the Arab world. Six panels of various research topics were enriched by discussions led by some of the most prominent figures in Arab theatre and performance studies. The festival honored twenty-two Arab artists and organized workshops, training for the benefit of theater amateurs, animating workshops dedicated to children, and allotted, next to the Festival’s Book Fair, a large space to signatures (book launches) of new theatrical releases. This last activity, together with press conferences related to competing plays, was organized inside the Mohamed V Theatre. In contrast to previous Festivals, this “most important Arab theatre event,” as Khalid Amine named it in a dialogue with the press, seized the opportunity of being in Morocco and celebrated its seventh anniversary by inviting scholars representing the West and allowing a considerable space for the discussion of the concept of “interwoven performance cultures.” One panel among six, was dedicated to the discussion of the theme: “Dialogue between North and South: Interweaving Cultures in Performance.” Participants in this Forum were Prof. Erika Fischer-Lichte, Prof. Stephen Barber, and Prof Khalid Amine (Chair of the panel). They approached the idea of theatre from an interwoven performance cultures point of view. They sought to introduce the idea of “the interwoven” to Arab theatre and performance studies researchers and specialists. They, as scholars concerned with “interweaving” as a cultural process affecting the field of theatre and performance arts, defined, disclosed, and revealed the hidden mechanisms underlying the history, use, and view of this concept in the world of performance cultures. It should be noted that the theme of the symposium is a continuation, not a repetition, of our discussions held in prior similar seminars, mainly that of “Theater and Cultural Identities,” which was organized by the Institute of Arab Theatre last year in Sharjah. We hope the Arab theatre gets fully engaged in this debate and that it will seek to strengthen the presence of the Arab theater inside the map of cosmic theater. Thus, contributions from non-Western cultures would no longer be systematically overlooked, denying the age-old interweaving between Europe and its various Others. Erika Fischer-Lichte, the initiator of both the project and, we may say, the theory of “interweaving performance cultures,” continued the discussion by introducing the main view she presents in her book The Transformative Power of Performance: A New Aesthetics; but this time she was addressing a non-Western audience. Her argument targeted “interwoven” moments in Western theatrical history. Therefore, she gave a synopsis of past East-West theatrical interwoven encounters illustrating her own field of vision, and supported her claim by citing the following examples. The question is difficult to answer for various reasons. For one, if we go deep enough into history, we find that exchanges between the theatrical forms of neighboring and later also of distant cultures occurred wherever we have some evidence of theatre. Theatre’s interaction with elements from other cultures has been a perpetual instrument and vehicle for change and renewal. In this paper, I present a few tentative reflections on the question of how processes of interweaving may, in unexpected ways, generate knowledge of the histories and the contemporary dynamics of performance cultures, and also–in the context of the theme of North-South dialogue–to present one or two ideas about the rapport between North and South, or South and North, especially on the shifting topographical and spatial orientation of that vector, and the dialogues it unleashes, especially in the medium of performance. The aligning and orientation of performance cultures, as within such topographical parameters as a North-South axis, will invariably generate tensions and fractures, as well as alliances or empathies, and it’s often through such essential tensions that knowledge of performance’s defining preoccupations originates. Such claims, and such assertions, prove the egalitarian foundation of “interweaving” as reality, vision, and project. Struggle is a symptom of equality among the coming together of performance cultures. For the Arab point of view, as a postcolonial culture, geography, and logos, the equation makes sense as lines of different cultures–in the project of interweaving–struggle over a status among other lines and do not passively submit. It also symbolizes that the process of weaving the thread of performance cultures together is a democratic performance/operation in which no culture, as a line, can stand without the support and sustenance of other neighboring cultures/lines. The Arab Theatre Festival is an attempt to spread the culture of theatre and performance studies/arts in the Arab world. Some of its main objectives are also the promotion of Arab cultures, arts, aesthetics, and research in the domain of theatre and performance arts. It is an outstanding project combating the decline of theatrical cultures within the Arab world. It, on the reverse, tries to foster interest in this domain by offering ample opportunities to different social actors to participate in conferences, workshops, training sessions, book launches, writing competitions, watching recent plays, getting introduced to recently published books and translations in the field of theatre, and attending press conferences and many other significant activities. Jaouad Radouani (Ph.D.) is a Moroccan researcher specializing in theatre and performance studies. He is also an active member of the International Center for Performance (ICPS) in Tangier organizing the yearly-held Performing Tangier Conference. He has participated in national and international conferences, study days, and workshops inside and outside Morocco (Europe, the Maghreb, & the Middle East) and published articles addressing questions related to topics including Arab theatre, the emergence/reception of new theatrical forms in the Arab world, site-specificity, and Moroccan ancient forms of performance arts. Previous sessions of the festival took place in Cairo, Tunis, Beirut, Amman, Doha, and Sharjah. Exceptionally, this year, two non-Arab theatre researchers attended the festival as official participants and gave talks in the scientific conference. The six panels are: (1) The Centenary of Moroccan Theatre. (2) Interweaving Performance Cultures: The North-South Dialogue. (3) Moroccan Theatrical Manifestos and the Future. (4) Theatre and Interaction of Performances. (5) Documentation of Moroccan Theatre: Whose Responsibility? (6) Arab Diaspora Theatre: Arab Visions or a Real Arab Theatre ? Dr. Erika Ficher-Lichte, Professor of theatre studies, Freie Universitaet Berlin, Germany, head of DFG Collaborative Research Centre “Performing Cultures,” and director of BMBF International Research Centre “Interweaving Cultures in Performance.” She has published widely in the fields of aesthetics, theory of literature, art, and theatre, in particular on semiotics and performativity, theatre history, and contemporary theatre. Among her numerous publications are The Transformative Power of Performance: a New Aesthetics. Stephen Barber is a fellow of the International Research Centre in Interweaving Performance Cultures at the Free University Berlin and a professor of visual culture in the faculty of art, design and architecture at Kingston University, London. He currently holds a major research fellowship with the Henkel Foundation. His most recent book is Performance Projections (Chicago UP/Reaktion), 2014. Khalid Amine, professor at Abdelmalek Saadi University, in Tetouan, Morocco, head of the International Centre for Performance Studies (ICPS) organizing Performing Tangier Conference, and a research fellow associated with the Centre of Interweaving Cultures in Performance, in Berlin, Germany.